As clothing and foodstuffs are not an investment, they will be completely consumed after being used for a certain period. Manufacturing those products till meeting domestic demand will yield benefits such as cost-effectiveness for users, job opportunities at factories and no need for importation. 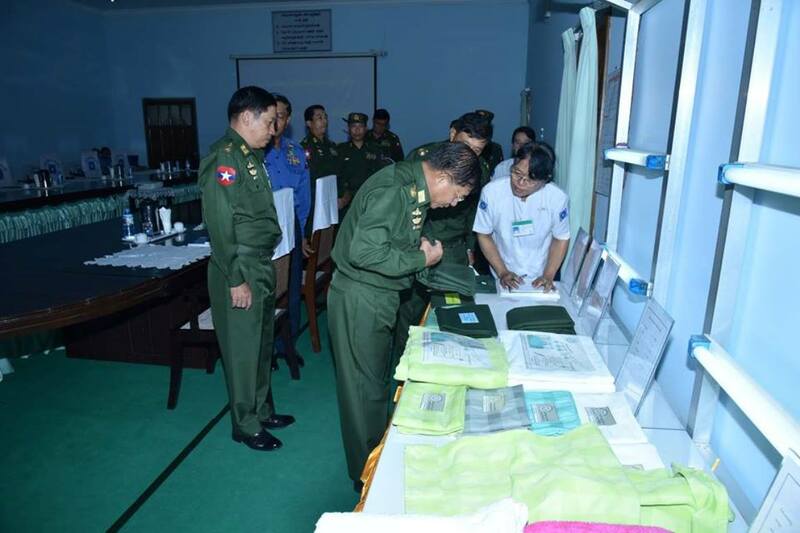 Therefore, Tatmadaw-owned factories must run at full capacity while factory workers need to do to the best of their ability, said Commander-in- Chief of Defence Services Senior General Min Aung Hlaing during his visit to Tatmadaw Textile Factory (Thamine) in Yangon this morning. 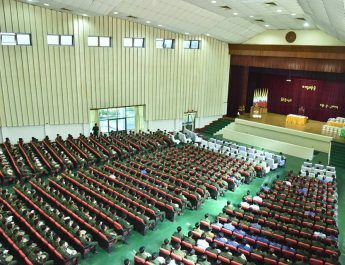 First, the Senior General, accompanied by Commander-in- Chief (Navy) Admiral Tin Aung San, Commander-in-Chief (Air) General Khin Aung Myint, senior military officers from the Office of the Commander-in-Chief (Army) and the Yangon Command commander, arrived at the factory this morning. At the meeting hall, the factory manager reported on the organization of the factory, machine installations, productivity, welfare tasks for factory workers and systematic sewage management. 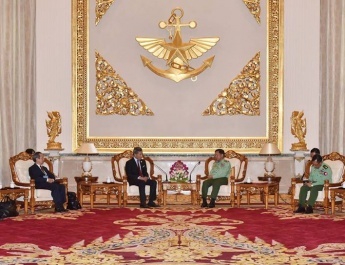 In response to the report, the Senior General said in manufacturing products, it is necessary to meet the needs for the Tatmadaw as well as the State. For example, based on the country’s population, about 6 million men wear vests and that means there is local demand and local market. Reviewing this, market demand must rise by improving product quality. 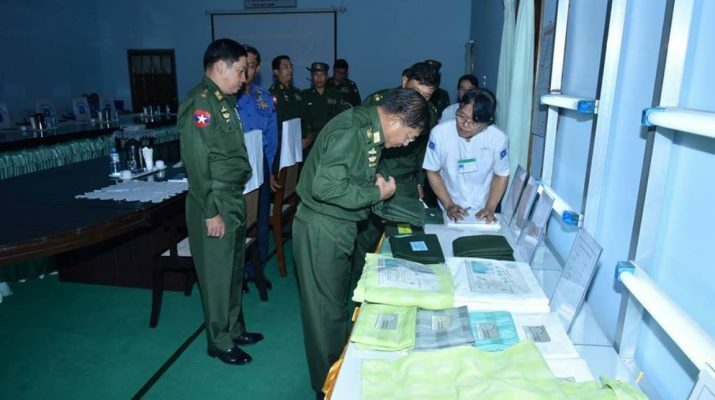 Tatmadaw’s products must be able to compete in local market in terms of both quality and price. While the factories need to improve the quality of their products, the distribution sector also needs to meet market demand and domestic demand. The Senior General stressed the need for the factory to engage in manageable agricultural and livestock breeding tasks for the welfare of workers. He then left an instruction on systematic sewage management. Then, the Senior General instructed officials to manage control of quality for textile and dyeing colours , good quality of dyeing colours at textiles produced from the factory, good tailoring quality and compare the factory’s products with textiles and clothes of other factories after viewing products of the factory. 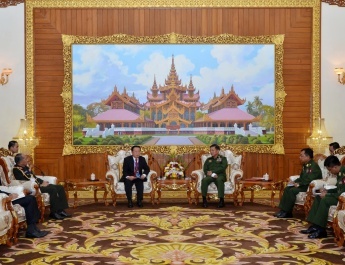 At the meeting hall of Tatmadaw Metal Products Factory (Okkyin), the Senior General and party heard reports on progress of the factory and situation of production presented by the factory manager. After hearing the reports, the Senior General gave instructions to officials that it needs to prioritize quality of products rather than the quantities in order to improve the quality of factory’s products. He also instructed officials to operate the machines of the factory at full capacity and meet the demand of domestic market with products of the factory. After viewing the products of the factory, the Senior General instructed officials to make innovative measures for production of actually useful utensils such as spoons, forks and food carriers made of steel and metal. After that, the Senior General inspected production process of the factory. Next, the Senior General and party proceeded to Shwe Phi Oo instant tea mix factory. At the office of the factory manager, the Senior General and party heard reports on year-wise production of tea powder, tea mix and Sun brand milk powder by the factory and plans to increase products. After hearing the reports, the Senior General gave instructions that the factory needs to use quality dried tea. As the production aims to have demand of the market, officials should always manufacture quality products with paying attention to the feedback of consumers. They must always supervise production of products free from chemicals and inspect the products to be healthy ones. The factory needs to produce larger quantities of products with lesser amount of profits so as to create job opportunities. Then, the Senior General and party inspected production lines of tea powder and tea mix in the factory where they were conducted round by the factory manager and officials. During inspection, the Senior General said arrangements are being made to increase production of more than 60 million sachets of tea mix without chemicals and incenses. Although Shwe Phi Oo tea mix sachets were produced with the purpose of distributing them to Tatmadawmen from the frontier lines only in the past, those products are being produced at domestic market due to production capacity of the factory. The Senior General then presented cash award to workers of the factory for making efforts to beef up production of quality tea mix products.